When last seen here a couple of days ago I was decrying Canada's marijuana laws which are inconsistent, expensive to enforce and counter-productive... if your purpose is to discourage Canadians from using them that is. Since then, the self-styled Prince of Pot, Marc Emery has been sentenced harshly to a five year sentence for openly flouting the US's drug laws. It's notable that the American prosecutor in this case openly stated what I spoke in my previous post on this subject: "...criminal prohibition of marijuana has utterly failed. It is dangerous, and wrong, and should be changed,” declared Mr. McKay, currently a law professor at Seattle University. “Brave agents and cops continue to risk their lives in a futile attempt to enforce misguided laws that do not match the realities of our society.” But there you have it, the law is the lawand prosecutors will do their jobs to the best of their ability and those who get in the way will be steamrolled. 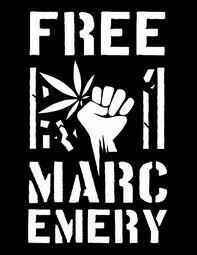 Marc Emery was contrite in declaring that he'd been arrogant in his open disregard of the law and that when his five year sentence was up he would work for the legalization of marijuana using more conventional methods. It is important for him in his future dealings with parole boards and such to display contrition and he no doubt genuinely regrets at least some of his behaviour. It is sad that Canada's government so willingly gave him up for extradition -- what he was doing was perfectly legal in Canada and remember it was seeds not pot he was selling. What makes Marc unique and a worthy cause célèbre is that he donated a lot of his proceeds to help fund lawful marijuana legalization efforts throughout the United States and Canada. There was a revelatory DEA press release back in 2005 touting his arrest that said, "Hundreds of thousands of dollars of Emery's illicit profits are known to have been channeled to marijuana legalization groups active in the United States and Canada. Drug legalization lobbyists have one less pot of money to rely on," former DEA Administrator Karen Tandy said in the July 2005 statement. To judge by this statement, the arrest and prosecution of Marc Emery certainly looks to be political in nature. Interestingly CNN reports that the statement has since been scrubbed. What do they have to hide?